Right, sorry. What was the name of that one you told me about? On a serious note, how is the dexterity in these gloves? I hate wearing gloves for fishing, even ice fishing as I have not found one with the dexterity to even accomplish the simplest of tasks. They look very sleek. I thought they were snowboarding gloves. I just wished that the cuffs are longer. I've tried many different "cold weather" gloves and in my estimation it's an inexact science. I have neoprene ones, but haven't even used them in years. Almost all of them have one flaw or another. Here's my go to glove when it's cold enough to necessitate wearing them. 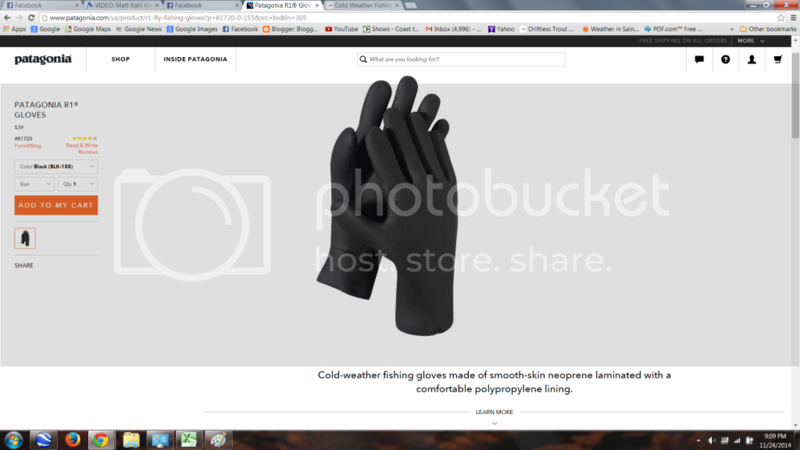 Generally they're called "Magic Gloves" and they're small and look like little kids cotton gloves. They're the last thing you'd think of for fishing but they work great. I often find them at Walgreens or sometimes WalMart for $1-$2 per pair. They look tiny, but stretch to provide a tight fitting glove that won't change the way you fish (like the big/bulky gloves that make fishing challenging). The idea behind these gloves is similar to a motocross rider's helmet visor "tear offs", (when your visor gets muddy you just tear off the layer and use the next one). You don't even bother to keep cotton/spandex Magic Gloves dry if you're in the heat of the battle or landing a fish. They are meant to be sort of disposable. I usually throw about 10-12 pairs in a pocket and when they get wet you just throw them in a different pocket, dry your hands on a small towel and replace with a dry set. If it's extra cold out double down and wear two layers. If you have big hands you may have to seek out the larger adult ones which are harder to find. Eventually hooks will get stuck in the fingers and tear them up and you'll have to replace them, but they only cost a buck or two so who cares. This approach probably isn't for everyone, but it's served me well for years after being disappointed with all the fancy gloves marketed as "cold weather" gloves. 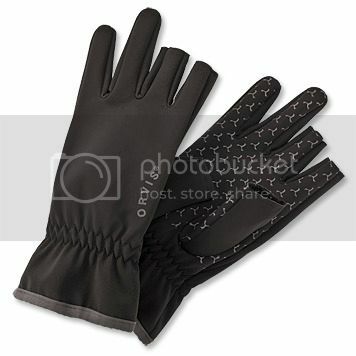 I have used gloves similar to the magic gloves. I believe I purchased these at Menards. I do a lot of work outside in the cold and they are nice to have around. After getting my $25 off any purchase over $50 coupon in the mail, I stopped at Orvis in Madison and picked these up. It is the 1st pair of cold weather fishing gloves that I have ever been optimistic about both warmth and dexterity. Will likely try them ice fishing before they get out streamside. Tried the Orvis gloves out yesterday while ice fishing. Temps were in the mid 30's with a decent breeze blowing. Hands got a bit chilly at the end of the day, but would have been frozen if barehanded. Next time I may try a disposable hand warmer on strategically placed on the back of the hand to see if that helps even more. Being a guy that NEEDS dexterity when wearing gloves, these performed well with the 3 open fingertips. They are the best combination for dexterity and warmth that I have found yet. Was nice not having to take gloves on and off all the time to rebait a hook, take fish off, etc. Definitely worth the $30 price tag. Follow up review. 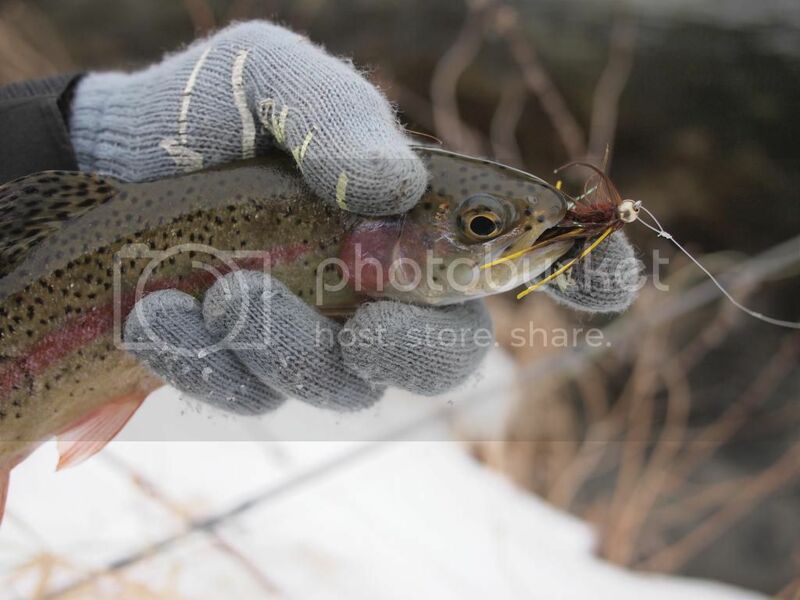 Have used the Orvis gloves below multiple times ice fishing and twice fly fishing, most recently this weekend. These are the 1st gloves I have been able to fish in consistently without removing. Definitely a good buy if you are like me and have a hard time fishing in gloves. They are somewhat thin, so they keep your hands just warm enough. After about a dozen outings, the grippies are starting to come off, but that is the only downside I have found with them.